In fact, students, faculty, staff, volunteers and visitors to campus have one of Canada’s top chefs planning and preparing meals for the entire campus community year-round. Earlier this year, Director of Food Services Luke Taylor was awarded the silver medal in the Canadian Chef’s Cup Competition. 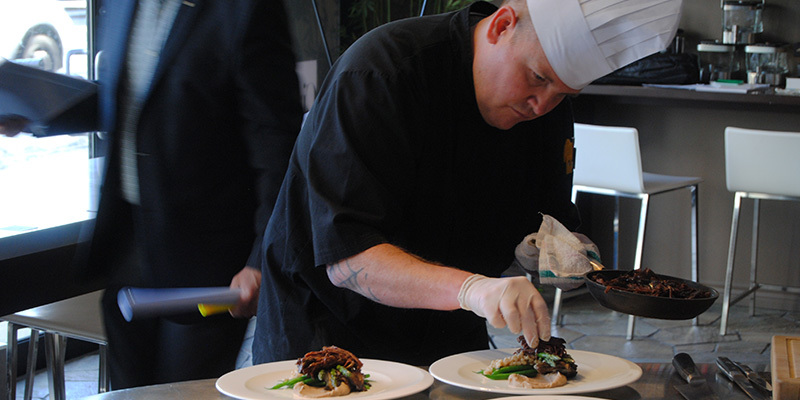 The competition, sponsored by Aramark, Pearson’s food services provider, was held in Toronto and drew “kitchen magicians” from across the country. During the competition, each chef was presented with a “black box” of ingredients and was asked to create his or her own masterpieces of culinary delights. A panel of Luke’s peers – other professional chefs – were lucky enough to sample all of the competitors’ creations and, after being sated, awarded Luke the mark of distinction. The truth is we almost had to drag news about this mark of recognition out of Luke. He’s a pretty modest guy and is very quick to share credit with his colleagues and team at Pearson, a point echoed by Ty Pile, Vice-President of Operations and Administration. “I was given a heads up by our ever-modest Luke when asking him what was new and how things went in Toronto. I was unaware of the competition,” laughs Ty. Competition organizers have posted a Google Doc file of some of the delicious images taken during the Toronto event – some of which show Luke in action! Enjoy, but a word of warning, try not to look at these if you are hungry!